Today, Global RESP Corporation (GRESP) is pleased to announce the winner of the third quarter RESP Contest: Leo Thein Maung from Chestermere, Alberta! 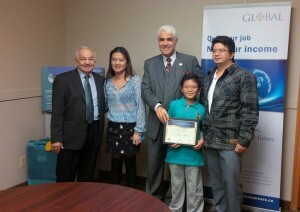 His mother, San Ma entered him into the contest for a chance to win a Global Education Savings Plan worth up to $5,000. Ma was already a GRESP subscriber, and had an RESP for son Leo. Now that she has won the contest, she has an additional boost to her contributions that will guide her son to a successful future. The entire family had the opportunity to meet with Sam Bouji, Founder of GRESP, in Alberta earlier this month. There are a lot of financial organizations registered to provide a Registered Education Savings Plan (RESP). But, just like the RESP itself, each provider is unique. And who you decide to go with can radically alter how much money the RESP generates over the lifetime of the plan. An RESP is a tax-deferred savings plan that can help you save for a child’s post-secondary education. With an RESP, you can make annual contributions of up to $2,500 per year, for a lifetime maximum of $50,000.